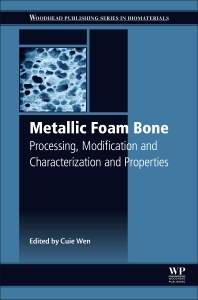 Metallic Foam Bone: Processing, Modification and Characterization and Properties examines the use of porous metals as novel bone replacement materials. With a strong focus on materials science and clinical applications, the book also examines the modification of metals to ensure their biocompatibility and efficacy in vivo. Initial chapters discuss processing and production methods of metals for tissue engineering and biomedical applications that are followed by topics on practical applications in orthopedics and dentistry. Finally, the book addresses the surface science of metallic foam and how it can be tailored for medical applications. This book is a valuable resource for materials scientists, biomedical engineers, and clinicians with an interest in innovative biomaterials for orthopedic and bone restoration. Cuie has published over 280 peer reviewed original publications in total and these publications have been cited for over 2000 times with an h index 20. She has also delivered over 170 keynote, invited and oral presentations at national and international conferences. Her research interests include metallic biomaterials, surface coating/modification of metals and alloys, development of porous metallic biomaterials (Ti, Mg, and their alloys and composites), porous metals for light weight structures (Ti, Al, Mg and their alloys), batteries, nanolaminates and nanostructured metals, alloys and composites with physical and mechanical properties.